What are the thoughts on running 5v vs 3.3v pro mini's for battery powered nodes? For sensors that need 5v are you running a 3.3v and stepping up to 5v or running a 5v and stepping down for the radio? Also for 5v pro mini's are you running 4AA batteries or doing a 9v battery or something else? @mhkid nearly alI my battery sensors run on 2xAA without regulator, except for pir sensors which run on 3xAA, also without regulator. The best if you want to run on batteries is to run at 3.3V (or less) and avoid sensors that need 5V. Everything is much more power hungry at 5V and sensors optimized for low power consumption run at low voltage. @yveaux - Sounds like you're running 3.3v pro minis or something similar? I think I remember seeing the post with a PIR running running 3AA so I'll take a look at that again and that might help me with 5v sensors. Have you run any 5v pro mini's on batteries? @nca78 - The preference would certainly be to run the lower voltage sensors but that's not always an option. I've got some sensors I want to run like a water pressure transducer that is 5v or a water flow meter that is 5v which I'd like to run on batteries because I don't have wired power available in the location I want them at. There are others too that aren't necessarily available in a 3.3v version. Do you have any experience or can you point me how to do this? @mhkid In addition to what has been said above, perhaps not immediately obvious is how many pins are left available after incorporating radio etc.. When I started off on my own particular saga I chickened out on bad soldering and bought in a custom 3v pro mini with onboard radio and RTC, but there were only 3 or 4 pins available however efficient the design, and both interrupt pins were occupied. Finally I ended up with a standard 5v pro mini with only the power led removed, powered by 4xAA via a signal relay, connected to the ultrasonic, passing data over I2C via a Level Converter. Everything but the 3v is powered off while it sleeps, the RTC wakens it every hour and powers up the 5v, which then executes it's routines.. Plenty enough pins spare on the 5v for anything required, and the 3v controls it all efficiently passing the data over radio to the Gateway. Early days for a definitive conclusion on battery usage, but it should be pretty frugal. In the end, whereas it would have been nice to get a 3v version of this type of ultrasonic, the reality is that it would have used all spare pins on the 3v pro mini with no expansion available, this combo solves that bottleneck. @mhkid Perhaps consider power generation at point of use, eg Solar ? @zboblamont - Great information, thank you. I've sort of been coming to the same conclusion but when I look it seems like most people are using 3.3v pro minis so it's really great to hear you're using the 5v. I ran into the problem with PIRs and trying to do all the tricks to make it run on 3v but it didn't work reliably for me. I don't mind running 4AA for those nodes and I don't mind the larger form factor. So are you running a nano to get more pins instead of a 5v pro mini? @mhkid Perhaps the post wasn't clear, the 3v pro mini handles comms between sleeps, the 5v pro mini provides the expansion but is powered off otherwise. The Nano is not so energy efficient as the pro mini. In your case I'm guessing you need 5v continuous rather than periodic power, so aside from more efficient voltage regulation of the power, you will need to generate power somehow. Will be installing pressure sensors for the pumped supply and filters at some point also, but have the advantage of mains power available so running a 5v pro mini with an RTC to do the analysis and interrupt the radio node is not a problem. Water meters are pulse versions here so again not a voltage issue. @zboblamont - So you mean you're running two pro minis (3v and 5v)? That actually sounds kind of cool. So both of them are running off the 4AA is that correct? Do you have a wiring diagram/sketch for how you have that hooked up and working? I'd be interested in how that works because that sounds like a really slick way to do it. Actually that's a good point about needing the continuous power for the water sensors. I actually would be fine without continuous power to the water pressure transducer but a flow meter I would probably need continuous power. What I'm designing is for livestock, specifically pigs in my case. For the pressure transducer I just want to know if there is pressure to their water supply so if it goes down I'll know right away so checking every few minutes is fine. But the flow meter is to measure their water intake and I'd need to have that running on continuous power to be able to measure that as they drink the water. I also want to measure water temp as the water is coming from a canal and if it gets to warm I want to know that. I put in a filter system this year and the pressure could also help me know if the filters need to be replaced. But your idea of running 3.3V and a 5V could make it possible to run them all off 1 radio. I am also considering running power to this location as well so I would then have a power supply but solar is also a good option. Normally they are pulse reeds or fets which can trigger an interrupt, not voltage dependent, so the Node sleeps between pulses. Have a Zenner 20mm out in the garden currently with a slot for their ludicrously priced reed switch, but found a spare reed which fits neatly in the cavity anyway. Unfortunately it's a 100litre pulse body and I really need 10l/pulse on the raw water line. The house consumption is a V200 piston meter with the Elster inductive FET unit bolted on top, pulses every litre, but about 40-50 quid from memory. If you are only taking pressure samples to check for bursts, perhaps a pressure switch may be more appropriate? @zboblamont - Below are links to what I have but am certainly open to other options. @mhkid Ok, see what you had in mind now. 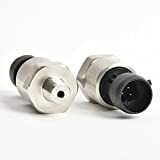 If it were me looking at doing it on the cheap, I'd screw down an old pump pressure switch or similar adjustable to simply connect when pressure falls below a set-point. A simple alarm out switch rather than sampling the sensor to decide on an alarm. For the water consumption, assuming the pump is powered, could your metering be done there, or is it not a dedicated supply? @zboblamont - interesting thought on the pump pressure switch. It's not a dedicated water supply. I'm in an irrigation district and the line is pressurized by their pump which is pumping from a canal. It does go down at times and then one of my neighbors or I have to call and alert them to come out and get it going. Yes you would think they would have some sort of alarm on their system but apparently they don't. I use the water for watering lawn, pasture, and just added the filtering so I could water my animals. I may end up with more than one flow meter so I can measure water consumption in each pen. These are show animals and water consumption is important as it relates to nutrition and weight gain. For meters, I would seriously reconsider the notion of using a turbine meter, they MUST be powered continuously. As the Limerick Man explained to the motorist asking directions to Dublin... "Well I wouldn't start from here..."
@mhkid For battery powered sensors, you should always try to go 3V3. And if necessary change the model of sensor. At 3V3 the consumption is lower as well, so you win twice the energy (very roughly). Your device should also sleep continuously between the sensor captures. It can become tricky. But I used a DHT22+328p+TI CC RF sensor powered by 3V3 on a single AA cell and up-converter for 5 years now, and I only need to recharge it every 4-6 month. There are no thoughts. Just get 3.3v pro mini. Generally speaking for any low consumption (battery driven nodes), try to get rid of 5v devices (chips or sensors). I have moved completely to 3.3v almost without regulators with exception of the solar /supercap node. @alexsh1 like I said of course it would be preferred to use the 3v sensors but that's not always possible. My question is more about what are people doing when they are using a battery powered node with a 5v sensor. @tochinet Do have diagrams, pictures and sketches you've posted? @maah This video doesn't show different ways to power an arduino it's talking about power consumption. I'm already removing the regulator, LED and sleeping it. I'm more asking about battery powered nodes with sensors than are more than 3.3v. How are people feeding 5v to these sensors? use 5v pro mini + 3xAA batteries + 5v sensor. This is going to be a very power hungry setup. I still have several old 5v sensors I used with Arduino Uno. I am just not using them any longer with one exceptions when a node is powered from mains. @alexsh1 Which sensor should I replace the water pressure sensor with? @mhkid IF the objective is only to detect supply pressure failure rather than monitor pressure over time for process reasons, why not use a pressure switch set between max supply pressure and Zero? Your processor sleeps until the switch detects a fall in pressure and wakens the processor to call home ? @mhkid I cannot see the consumption. Do you have the datasheet? @alexsh1 it is a mechanical switch, just like a button or reed switch. @yveaux Maximum operating current - 500mA. It depends how often the pressure is going to change, but one can pretty much forget about batteries as the source of power. Thanks for all the suggestions and replies. I'll take all the info, weigh the options and then report back on what I end up doing. I have just received one today and going to tinker with it. To me it seems like a good idea to have a powerful sensors with Arduino on batteries. @alexsh1 - Thanks for the suggestion. I'll be curious to hear what you think of the TPL5110. @alexsh1 look at the schematic; it is just a mechanical switch with 2 wires. It can probably only carry 500ma max. @yveaux Are you sure you are not talking at crossed purposes about different devices? The device @mhkid was originally referring to is the one with the 5v supply requirement, Circuit hopefully below. @alexsh1 Mea culpa, too many crosslinked discussions; apparently I lost track. @alexsh1 Much the same principal as my 5v/3v solution for the 5v ultrasonic, only here I used a latching relay leaving the 3v Arduino on sleep power consumption. An interesting device however, with a low standby and effectively a timer function, it has many possibilities. Where this original project has been skewed is unfortunate, the selected devices compel the dual voltage solution, whereas an alternative strategy removes the need for it completely. Although pulses and switches can be regarded as "old" technology, they can still be highly effective for battery powered applications where energy conservation is critical..